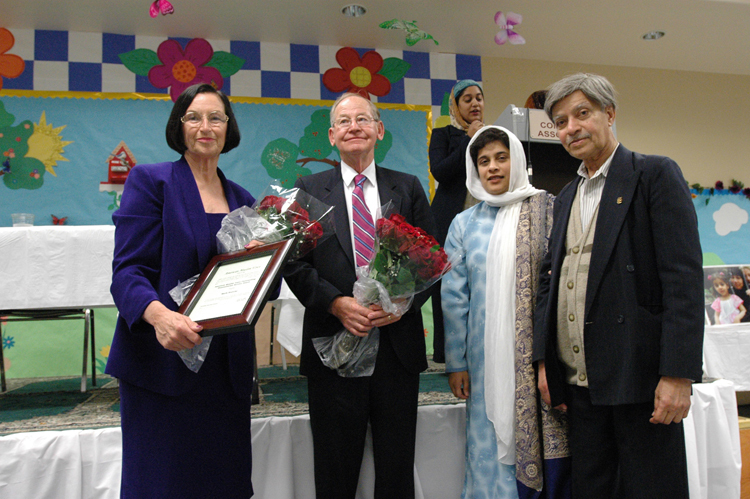 American Muslim Voice along with CAIR, MCA, Bay Area Muslims, Arabs and fellow Americans honored the life and work of Marla Ruzika with an inter-faith dinner at the Muslim Community Center (MCA), Santa Clara,on June 10, 2005. Marla Ruzicka was killed in Baghdad on April 16, 2005 by a car-bomb blast in Baghdad. She was a tireless humanitarian and defender of human rights. Originally from Lakeport, CA, this long-time Bay Area resident worked to soften the impact of US military intervention on civilians abroad. She helped USAID and the Senate distributes humanitarian supplies in Afghanistan. In Iraq, she set up an organization to determine the needs of Iraqis affected by the US invasion – an essential service for the international humanitarian community. Thank you for your kind words and support. I am thankful to Allah for his guidance and all his blessings. This event was very important to me because this young woman lived an exemplary life and died serving innocent Iraqi civilians. I wanted to make sure that her parents felt welcomed and honored. I have received phone calls from Medea Benjamin of Global, Marla's parents, Nadia , the mother of a fallen American soldier and few of our Muslim community members to say thank you to us for organizing such an elegant event. The fellow Americans enjoyed meeting Muslims and were very touched by the soft & kind hearted women who were crying. 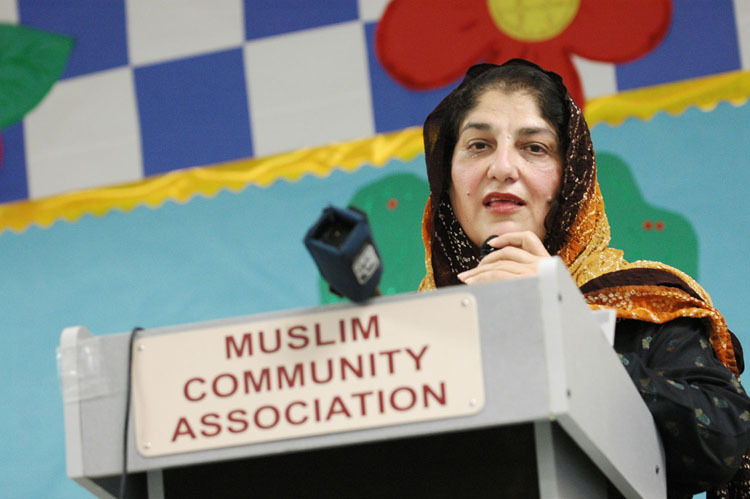 I would like to take this moment to encourage all Muslims to consider joining our Campaign " AMV makes activism and community building safe and easy" so we can put a Muslim face in every community. As we all know how Lodi story is being covered. On one station I saw two different responses from fellow American. They were asked the same question, how do they feel about this incident, are they concerned about their safety. The first one said he does not have any complain because he knows some Muslims and they are good people, the other woman said that yes she is very concerned and constantly looks over her shoulder. The only difference is human connection. The media reporters were great. We got coverage on channel 2, 4, 5. 7, 11 and some local stations. I am learning a lot about them. I was asking them to have dinner with us but they all said that they are OK. After passing by them again I would say please join us for dinner. They told Medea that Samina is treating us as guests but we are not use to that and we are not suppose to eat on duty. This is the second time that I have been told that I see them before I see their camera. So this is tip of the week let us practice Islam in every aspect of our life. That is all what I was doing not treating them special but treating them as human beings and our guests. Let us truly work together in the future so we can serve fellow humans better. I am so grateful to all my friends and AMV community builders for being there. Except two( due to personal unexpected events) all of our local Bay Area member were there. I would also like to thank CAIR and MCA for co- hosting with AMV and 21 organizations for co-sponsoring including SBIA. Reshma Yunus of Semah was the technical assistance for Marla DVD. Amina from CAIR and I worked on flyer and the program. Last but not least I would like to thank Marla' parents and friends. And my extended family( my fellow American ) for their continuing support. These are relationship I have made in the past 23 months. This event was truly a labor of love. Most of the food was donated by Chandni, Mehran and Zafran. MCA provided the facility, CAIR provided all the party goods and salad, Salam cola provided the drinks, my friends Aseya Iqbal, Firdos Kamran and Huma Siddiqi provided pasta. Zeya Mohsin provided riata and Areena Chudary provided pita bread. I cooked Channa daal and mixed vegetable curry. Shanaz Kamil and Romana Malik made the desert, Yaseen's corner set up the tea and water stations. The community members were great in serving and other assistance. Our videographer gave us a deep discount and the professional photographer Scott offered to take photos. Copy America of Palo Alto donated the time so we can make a nice book and an award AMV presented to Marla's parents. Last but not lease I would like to thank Uncle Abdul Aziz and his MCA team for their contribution of setting up the hall so beautifully and for the best hosts. being So you see this was truly a team effort. The inter-faith dinner, attended by a large number of people, was co-sponsored by 21 organizations: Al-Qalam Institute, American Friends Service Committee, Amnesty International, Blossom Valley Muslim Community Center, Chandni Restaurant, Newark, CA, Friends Committee On National Legislation, Global Exchange, Interfaith Freedom Foundation, Islamic Society of East Bay, Islamic Society of Monterey, Islamic Society Of San Francisco, Mehran Restaurant Newark, CA, Multifaith Voices for Peace and Justice, Rahima Foundation, Salam Cola, Semah Inc., South Bay Islamic Association, South Bay Mobilization, Tri-City Peace & Justice, United Muslims of America and Zafran Restaurant, Santa Clara, CA.